The Bonelli’s Eagle (Hieraeetus fasciatus Vieillot, 1822) belongs to the order of the Accipitriformes and to the family of the Accipitridae (Falchi ed Aquile) (Hawks and Eagles) which counts 64 genera and 237 species. Inside this group is confined a very vast variety of the so-called “birds of prey”, therefore, vultures, buzzards, harriers, kites, hawks and eagles, but the typical falconets and falcons assigned to the family of the Falconidae. It should be clarified that in science there is still now an ample debate about the real assignation of some genera to one or another family, as well as of species within the single genera. During the last years with the advent of genetic researches with the study of the DNA, we are witnessing a revolution of the assignations which will sure lead to new reclassifications. The Hieraaetus fasciatus is a small eagle but able to express the power of these mighty birds, rightly placed at the end of the food chain, as well as the slenderness typical of their cousins, the falcons. Only in few European vulgar names is reported the name of Bonelli’s Eagle, the eminent Italian ornithologist who lived in between the XVIII and the XIX centuries who studied it assiduously and to whom it is later on honoured. As a matter of fact, in French it is called Aigle de Bonelli, in English, Bonelli’s Eagle, in Italian Aquila del Bonelli, but in German it is Habichtsadler (Eagle Goshawk), in Spanish Aguila-azor perdicera (Eagle Goshawk of the partridges), in Catalan Aguila cuabarrada (Eagle with barred tail), in Dutch Havikarend (striped Eagle) and in Swedish Hökörn, names more meant to evidence its behaviours and characteristics instead of reminding the name of the ornithologist discoverer. The scientific name of the genus comes from the Greek “Hierax”, hawk and “aetos”, eagle, to identify its intermediate status between a true eagle and a hawk; the name of the species from the late Latin “fasciatus”, equipped with stripe or band, with probable reference to the black stripe present on the final part of the tail. 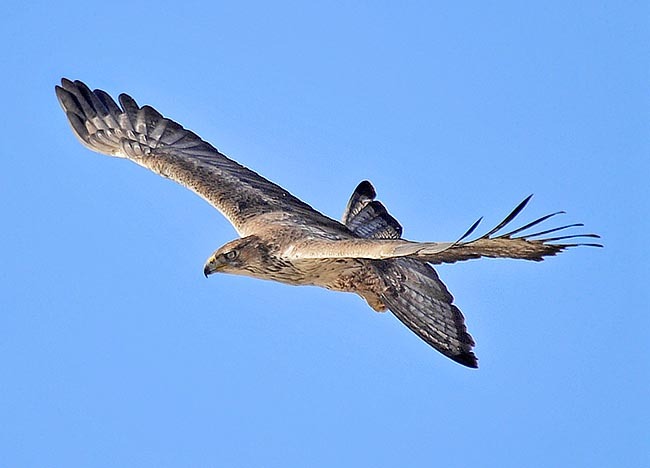 The Bonelli’s Eagle has an ample diffusion which includes Europe, Africa and Asia but even if present on a very vast area, only in some locations it evidences consistent populations and such to guarantee its survival. In Europe it is present mainly in the Iberian Peninsula, where the most numerous population resides (about 6/800 pairs), but is found also in southern France, in Sicily and in Sardinia, in Greece and in the Balkans but always in an extremely reduced number. Outside the Spanish range this eagle is considered in Europe as a rather rare and little visible bird, subject to worrying fluctuations in the number and such to retain its continuity at risk. In the extra-European Mediterranean regions, it is present with a good population in Morocco, strictly linked to the Iberian one, whilst in Algeria, Tunisia, Israel and Turkey they remain in a much reduced number. In Asia it occupies the whole Indo-Pakistani area, the southern belt of China and isolated from any contact, the population of the ssp. renschi which lives in Indonesia in the Lesser Sunda Islands. Two subspecies have been, in fact, classified: the Hieraaetus fasciatus fasciatus, the most numerous and geographically compact original strain, and the Hieraaetus fasciatus renschi, confined, as we have said, in the Indonesian Sunda Islands (Sumbawa, Wetar, Flores and Timor). 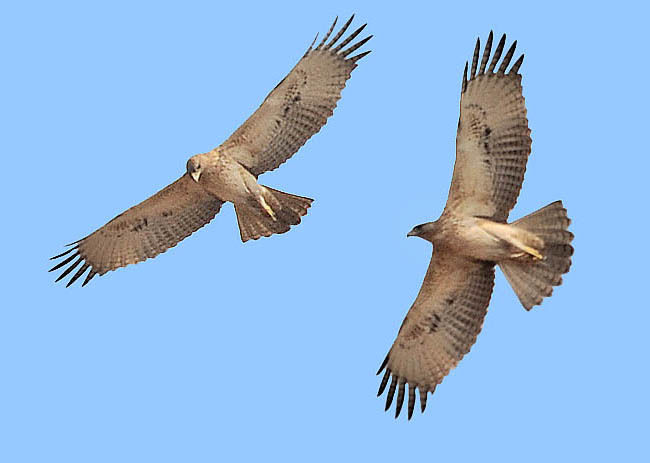 They have identified one super-species born from the combination of the Hieraaetus fasciatus, with an autochthonous African species which is often considered as its conspecific, the Hieraaetus spilogaster (the African Hawk-eagle). They are species very similar morphologically but easily distinguishable in nature. Therefore, there is no geographical overlap between the two species. 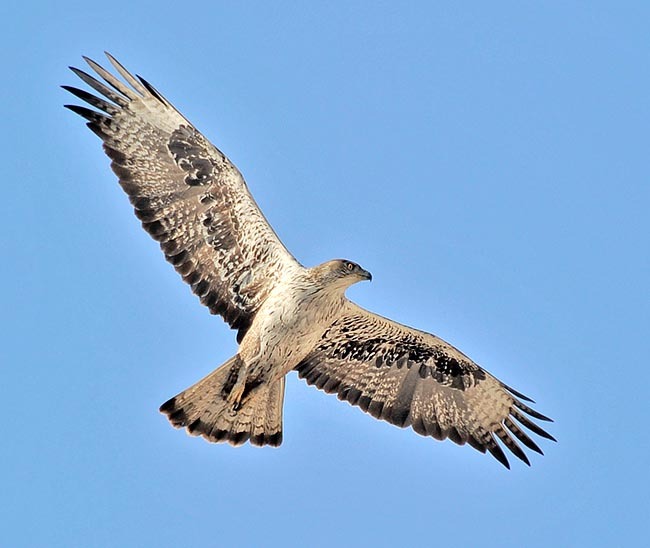 The Bonelli’s Eagle is a sedentary raptor and limits to erratic short-range displacements when not nesting, even if, often, it remains in the same area for the whole year. The juveniles are more erratic and during the first year of life they venture out for some hundreds of kilometres in every direction looking for areas not occupied by adults, in order to take advantage from the bigger food availability. Often, during this phase, they get closer to the inhabited centres than the adults which disdain every anthropic contact. As a matter of fact, this eagle is more frequently observed during these movements. Even if being a small eagle, it has however very respectable measures with a wingspan of about 180 cm, a length of 70 cm and a weight varying between the 1500 and the 2500 g. As often is the case in the raptors’ world, the female is slightly more powerful than the male. The adults have a clear colouration with slight blackish bars on the abdomen and very dark median belt of the wings in clear contrast with the white areas. The tips of the primary flight feathers are black with ample apical edging of the whole wing formula. The female results more strongly marked. The tail is barred in its terminal part and is well visible when flying. There is a well evident wide white spot on the dark rump and blackish beak with slight yellowish cere. The young are very clear, without under wing bars and streaks on the chest. They do not have the black bar on the tail which, consequently, results being extremely clear when kept open during the twirling. They have an amber pink colour and are practically not comparable to the adults of the same species. The subspecies renschi is slightly smaller and more barred. 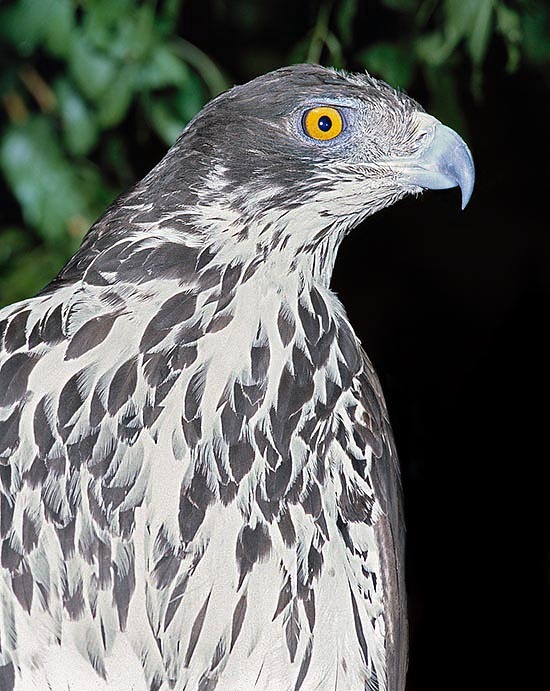 The Bonelli’s Eagle has a very light flight positionable between that of a buzzard and of a goshawk and assimilable to its congeneric Booted eagle (Hieraaetus pennatus). Deep beats and rather rapid but not heavy and performs aerial moves with the agility of a kite moving the tail in a similar way, with strong turns, rises and overturns, especially when hunting in the air. Like all Accipitridae it loves twirling with remarkable mastery and even at high altitude, evidencing in its silhouette the long tail and the neck, well prominent on the body. It is easily mistakable with several of its congeners especially when in juvenile and sub-adult livery and often only an experienced eye can determine the species for sure. It nests in warm areas, sunny and arid, little woody and often spotted by rocky hills on whose rocks usually places the nest. It is a rather reserved species which looks for not anthropized locations even if, in certain cases, it has accepted the human presence provided missing of persecution. The pair is monogamous and it is thought to remain as such for the whole life. The nest is a pile of branches which may reach, in the years, considerable size and is usually chosen among the various built for such purpose and used in alternately in different years. In some cases it spawns up to three eggs but usually it keeps tied to the traditional two laid by this family of birds. The brooding is mainly done by the female and only occasionally by the male when the nest is left unwatched. The hatching takes place after about 40 days and the young fly away after 10 weeks. Even if usually in the broods of these birds only one young survives, in the Bonelli’s Eagle we assist sometimes at the flying away of two young. In any case, they have a strong juvenile mortality reaching the 50%. The sexual maturity is reached upon completion of the adult livery, therefore after the third year even if are possible cases of precocious nesting also in juvenile livery. The main feeding of Bonelli’s Eagle is linked to preys seized on the ground and includes rabbits, partridges, squirrels and other rodents. 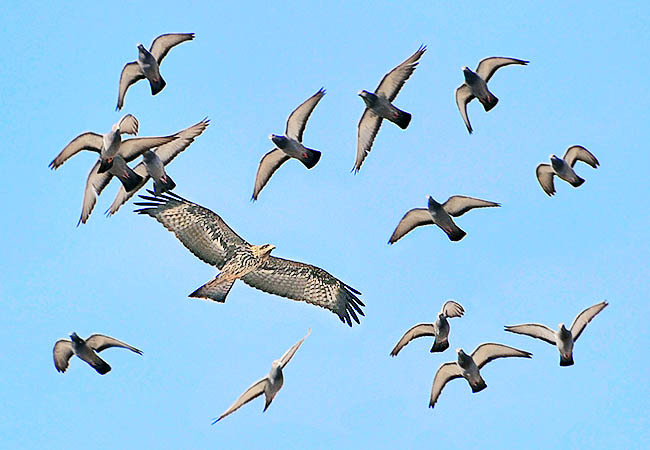 In case of scarcity, it catches corvids, small gulls and pigeons directly while flying where it shows a remarkable ability and manoeuvring speed. In these cases the pair often hunts together. In India, off the nesting season, it is often sighted twirling close to the inhabited centres flying after the numerous flocks of pigeons. It is not an endangered species and is placed in CITES II.